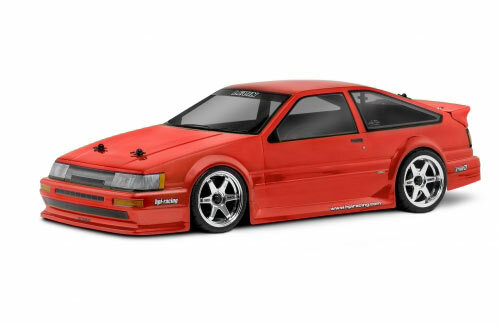 All Products > "17214 HPI Toyota Levin AE8 Body 200mm"
Included with the body is a huge pre-cut vinyl decal sheet with window lines, headlights, grilles, tail lights, HPI logos and extra 'tuner' decals for a realistic look. A convenient overspray film is included, as well as vinyl window masks to make painting quick and easy. To make mounting the body simple, an instruction sheet is included and the body has dimple marks for drill locations. The 190mm width is perfect for most electric touring cars.